Viciousness of Sportsnet, death of journalism – or Colangelo talking through Rogers’ talking heads? SPORTS FANS, his Toronto Raptor team-mates and Andrea Bargnani and his family must have been shocked and stunned by the host of Rogers Sportsnet Connected on Monday, November 26. Leading into the 5:00-6:00 p.m. supperhour segment she asked rhetorically, “Has Andrea Bargnani’s time in Toronto run out?” Thinking it was to be a lead item I waited for the surprising news. And waited. And waited. Finally, some fifty minutes later, she flatly announced with a straight face that Mr Bargnani was on the way out and that “fans have given up on him.” (How she divined this insight only an Insider can figure out.) The host then followed up the shock attack by interviewing one of Sportsnet’s ubiquitous “Insiders,” Michael Grange, to explain it all. Is now the time to trade Andrea Bargnani, he was asked. Field of schemes: finance capital, which lent $500 million to Miami Dade County to finance the white elephant, take the people to the cleaners in a deal brokered by Jeffrey Loria – the same ”art dealer” who snookered the Montreal Expos for a song. MIAMI – “Fool me once, shame on you; fool me twice, shame on me.” So goes the saying once famously mangled by George W. Bush. But what do you say when you are fooled not twice but thrice? Forget it, Jake, this is Miami? 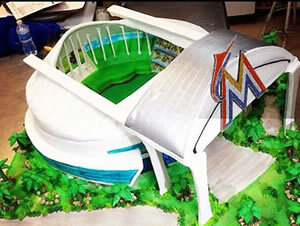 I had to resort to fiddling with a memorable line from Roman Polanski’s classic movie Chinatown because popular adages don’t even cover the level of foolhardiness Miami baseball fans, public officials, and community boosters have displayed over the last fifteen years where the Marlins are concerned.